We invest a lot in our apprentices because we want you to be the future of our business. A Chester Hall Apprenticeship will give you excellent learning, real experience and an attractive salary. But it’s not just about what we can give you – it’s what you can bring to Chester Hall. We are looking for people with attitude and a desire to succeed. Show us you’ve got what it takes to be one of our Apprentices and we’ll make sure you have the opportunity to learn all the technical and behavioural skills you need. We offer a variety of exciting, challenging and rewarding career paths. You could even make it all the way to the top! Procat Technical College, Basildon, UK. Fabrication and welding. Straight from school in 2012, I started my 2 year BTEC apprenticeship at Chester Hall. After completing the 2 years I moved on to do another 2 years doing a HNC course in general engineering. I have now completed my HNC at a high level and I couldn’t have done it without the support of the company letting me have time to go into college on various days to get help. Throughout the time in the apprenticeship, I have been to many places with the company. From tooling and material companies like Fenn and AMI metals down to visiting shows such as Farnborough air show and MACH exhibition. I can honestly say I have enjoyed my 4 year apprenticeship with Chester Hall and couldn’t thank them enough for supporting me through training, inside work on the CNC machines and also at PROCAT college in Basildon. I have now completed my HNC at a high level and I couldn’t have done it without the support of the company letting me have time to go into college on various days to get help. Throughout the course Chester Hall allowed me to concentrate on the coursework and gave me the freedom and help to achieve a high grade. I started my apprenticeship in 2012 through a college called Prospects, now known as PROCAT. There I learnt the fundamental skills I would need to become a skilled engineer. This was a BTEC level three course. For the first year I was permanently at college, the second year was on day release. Throughout the course Chester Hall allowed me to concentrate on the coursework and gave me the freedom and help to achieve a high grade. We visited different companies that we deal with and also took some trips to get involved at looking at new machines, tooling and techniques of cutting, these places included 3G, Fenn, Mach and Farnborough. I then went on to do further education to add knowledge and skills to my trade by completing a HNC with a high grade once again. I believe Chester Hall has allowed me to voice my own opinion on the path I want to take and allowed me to construct my own career in terms of what department I feel suits me best whilst mentoring me and supporting me through this 4 year apprenticeship. I can’t imagine I would have had a better one elsewhere. 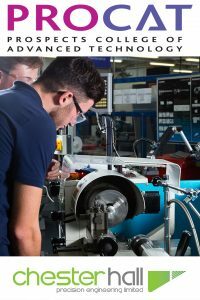 The apprenticeship scheme has given me new learning experiences such as carrying out a Level 3 Engineering certificate and I am currently sitting a HNC Level 4 Engineering course. I have gained experience and knowledge while travelling around within the company. I have trained in different areas such as 3 axis CNC machine setting and operating, the Assembly department, the Manual operations department and Quality Assurance. 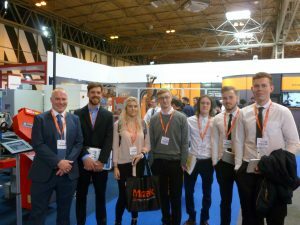 Doing my Apprenticeship at Chester Hall has given me many opportunities to visit different events such as the Farnborough Air Show and MACH and Companies such as Fenn Tool Limited. This has helped me to understand different aspects of how the companies that we associate with operate and how our work is unique. To launch your career with Chester Hall send your CV today!